Nelson Mandela traces his lineage back to the Thembu Chief Nxeko, one of the early Thembu Kings who ruled over Thembuland, a territory that eventually became known as the Transkei. The historical record shows Xhosa lived on the banks of the Buffalo River in 1686 and settled at what is now Somerset East in 1702. In the 1770s, Whites settlers encountered Xhosas clans on the fringes of the Tsitsikama forest and in 1778 drove them back from the Gamtoos River to the Fish River. The emergence of Zulu King Tshaka , his conquest of large parts of Natal, and the consequent expansion of the Zulu kingdom lead to enormous upheaval in the region and the displacement of entire communities. Many fled across the Umzinkulu River and into Pondoland and further south. White settlers, mainly Afrikaans speaking farmers, trekked deep into the territories of local chieftainships in what came to be known as the Orange Free State and the Transvaal before their expansion was halted in the late nineteenth century by the powerful Zulu Kingdom. British commander Harry Smith crosses the Kei River with a large force, marking the beginning of a systematic conquest of the Tembus, Pondos, Fingoes and Xhosa communities in what came to be known as the Transkei and Ciskei. Smith's invasion formed part of what came to be known as the Nine Xhosa Wars or Frontier Wars that spanned a hundred year period and eventually led to the imposition of British rule in the Eastern Cape following the 9th Frontier War in 1879. The British administration imposed the Village System or Grey System of local government on the territories conquered in the successive wars. 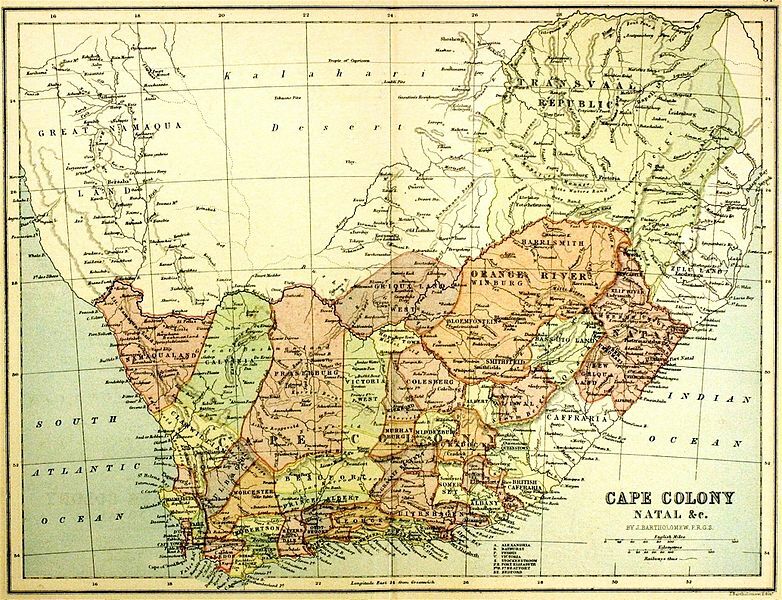 Devised by Sir George Grey, the Governor of the Cape Colony at the time, the system divided land into counties, towns and villages and gave them English names. Mission schools are established and Xhosa children were obliged to attend to learn English language and culture. The start of the 8th Xhosa war and the British under the command of Colonel Mackinnon After mutual setbacks and atrocities, the Xhosa people were driven from their mountainous refuge and 'British Kaffraria' (later Ciskei) was occupied. Relatively unscathed before, the Tembu people now fell under British control and their chiefs were imprisoned or exiled to Robben Island. The island and the incarceration of the Xhosa chiefs such as Makana enter Xhosa folklore and become notorious in Xhosa histories of resistance. A young woman, Nongqawuse, has a vision that leads her to prophesise the imminent return of the ancestors who will restore their land. In preparation for that liberating time, most Xhosa homesteads sacrifice their cattle and livestock, an event that has come to be known as the Xhosa cattle killing. Over the course of a year, most families sacrificed their cattle and refrained from planting new crops, resulting in destitution and starvation. Over 40 000 people died and as many were incorporated into the colonial economy as wage labourers. Coming on top of the massive loss of lives and the destabilisation of the social and economic fabric of those tribes who fought against the conquest and colonisation of the Eastern Cape, the cattle killing was a turning point in Xhosa history and subjugation to British imperialism. 9th Xhosa war ends and the two main Xhosa tribes are forced across the Kei River. Ngangelizwe, grandfather of the Tembu Chief Jongintaba Dalindyebo, dies. Jongintaba Dalinyebo would later become Nelson Mandela's guardian, entrusted to him by Mandela's father on his death bed. Pondoland, the northern part of the Eastern Cape, falls under British control.